In the early 1960s, the United States Air Force's Military Air Transport Service (MATS) relied on a substantial number of propeller-driven aircraft for strategic airlift. As these aircraft were mostly obsolescent designs and the Air Force needed the benefits of jet power, the USAF ordered 48 Boeing C-135 Stratolifters as an interim step. The C-135 was a useful stop-gap, but only had side-loading doors and much of the bulky and oversize equipment employed by the U.S. Army would not fit. The prototype and development aircraft then began an intensive operational testing program including the first delivery to MATS (63-8078) on 19 October 1964 to the 1707th Air Transport Wing, Heavy (Training), Tinker Air Force Base, Oklahoma. Testing continued and a Federal Aviation Authority type certificate was awarded on 29 January 1965. The first delivery to an operational unit (63-8088) was made on 23 April 1965 to the 44th Air Transport Squadron, 1501st Air Transport Wing, Travis Air Force Base, California. Although operational testing continued, due to the United States' military involvement in South Vietnam, the C-141 was soon employed in operational sorties to the combat zone. Between 1996 and 1998 a C-141A was used as a towing aircraft in the Eclipse project (NASA) to demonstrate the possibility of using aerotow systems to bring towed winged vehicles to sufficient altitude to launch small satellites, the ultimate goal was to lower the cost of space launches. Six successful tests were flown with a modified Convair F-106 Delta Dart, the QF-106 variant, in tow,  piloted by Mark Stucky. [ citation needed] A similar system can be seen in SpaceShipTwo, whereby atmospheric engines carry a rocket-engined "second stage" to high altitude for launch. The original Starlifter model, designated C-141A, could carry 154 passengers, 123 paratroopers or 80 litters for wounded with seating for 16. A total of 284 A-models were built. 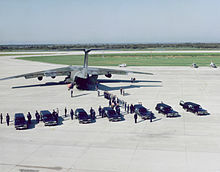 The C-141A entered service in April 1965. It was soon discovered that the aircraft's volume capacity was relatively low in comparison to its lifting capacity; it generally ran out of physical space before it hit its weight limit. The C-141A could carry ten standard 463L master pallets and had a total cargo capacity of 62,700 pounds (28,400 kg). It could also carry specialized cargoes, such as the Minuteman missile. In service, the C-141 proved to "bulk out" before it "grossed out", meaning that it often had additional lift capacity that went wasted because the cargo hold was full before the plane's weight capacity had been reached. To correct the perceived deficiencies of the original model and utilize the C-141 to the fullest of its capabilities, 270 in-service C-141As (most of the fleet) were stretched, adding needed payload volume. The conversion program took place between 1977 and 1982, with first delivery taking place in December 1979. These modified aircraft were designated C-141B. It was estimated that this stretching program was equivalent to buying 90 new aircraft, in terms of increased capacity. Also added was a boom receptacle for inflight refueling. The fuselage was stretched by adding "plug" sections forward and aft of the wings, lengthening the fuselage a total of 23 feet 4 inches (7.11 m) and allowing the carriage of 103 litters for wounded, 13 standard pallets, 205 troops, 168 paratroopers, or an equivalent increase in other loads. 12 April 1967 (1967-04-12): C-141A, AF Ser. No. 66-0127 crashed after taking off from Cam Rahn Bay AB, Vietnam. Five crew were killed and 2 were rescued.